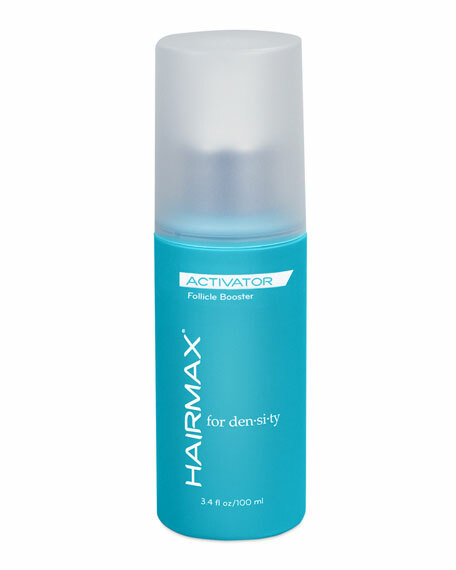 Hairmax Activator for Density, 3.4 oz. HairmaxActivator for Density, 3.4 oz. Fortify and enrich your scalp with this breakthrough, high-performance, leave-in serum spray. This unique peptide complex, designed for thinning hair, is loaded with a proprietary blend of follicle-boosting nutrients, antioxidants and DHT blockers that fortify and revive hair follicles to promote scalp health. HairMax Activator nourishes your scalp and encourages naturally thicker, stronger, healthier looking hair. Directions: Use daily on dry or damp scalp. Spray on scalp until the entire scalp is treated. Massage in to ensure even distribution. Do not rinse. For optimal results, use the complete HairMax Density System. Avoid eye area. For in-store inquiries, use sku #1689605.